Crummy cover aside, I’m all in for this issue. Guice has his first go-round as regular artist after a handful of missteps, and he’s a good fit. Unfortunately, there aren’t nearly enough scenes with our New Mutants. It is nice to see Magneto get some page time this month, and not of him sitting and thinking. 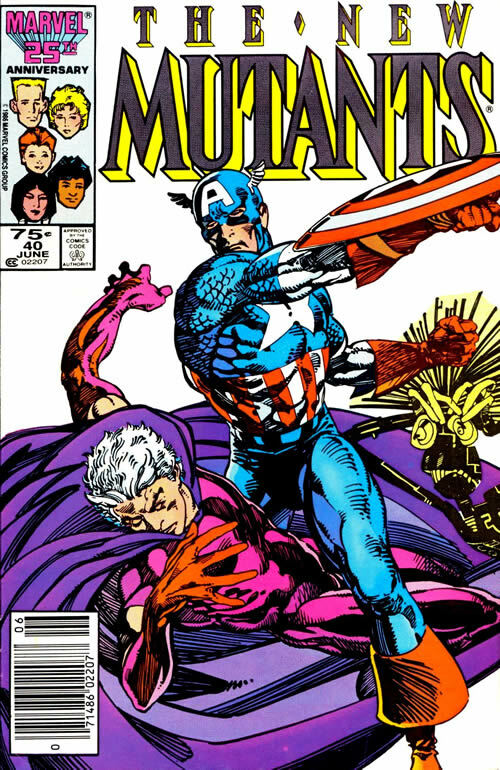 The Avengers are called to arms, and Magneto spends this issue fending off their attacks. Warlock (flying in Blackbird form) has been throttled by Hercules and Magneto volleys back and forth between defending himself and putting Warlock back together. Still a wanted criminal, Cap and the Avengers are flummoxed as to why one of the world’s mightiest villains isn’t fighting back. It turns out that Magma can sense earth being disrupted, even to the point where she can feel Magneto’s mojo working on it. The New Mutants travel through Limbo to confront the Avengers, but moreso come to the aid of their headmaster. A shame the Avengers still think that Magneto is up to no good and forming a younger Brotherhood of Evil Mutants. And the White Queen…still up to no good? She’d made their minds whole, but not their hears and souls. Magneto and the kids go back to her school where they’re all patched up.